A spider angioma is a small capillary that is dilated. When a small group of these capillaries are near the surface of the skin they can look like a spider web. 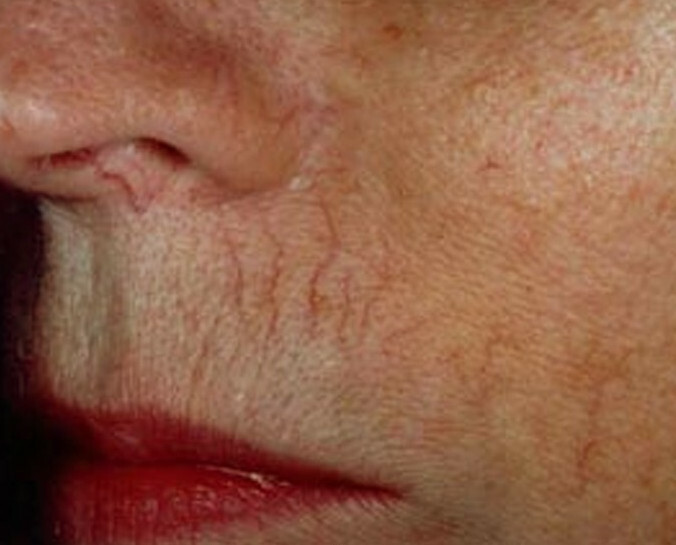 They are common and yet they are an abnormal group of capillaries near the skin's surface. It is also called Nevus araneus, spider veins, vascular spider or spider telangiectasia. Spider angioma (Nevus araneus) has no symptoms besides its own appearance. The most common place to find spider angiomas is on your face or torso. They can also be seen on ears, hands or forearms. Sometimes they appear as one and other times there are several. 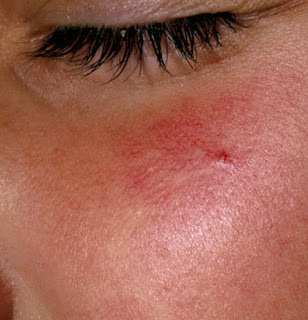 A similar condition is cherry angioma which is usually dilated capillaries in a clump, that does not radiate out. 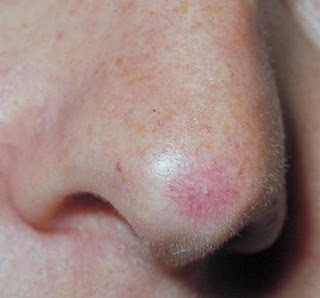 Spider angiomas are generally benign resulting from dilated capillaries. There are six medical conditions which include spider angiomas as symptoms. Wilson's disease is a rare genetic disorder which can be fatal if it is not diagnosed. It is due to a high level of copper in the liver. Spider angiomas which occur during pregnancy or with high estrogen content in your system will usually resolve themselves and disappear over time. Spider angioma (nevus araneus) has no other external symptoms besides its appearance. If you press on the center it disappears, but it returns when the pressure is removed. Taking the patient's medical history is also important and helpful. Ask about a history of alcohol abuse. Is the patient taking medication that can cause liver damage? Is the female patient taking oral contraceptives or hormonal supplements?